It’s no secret that video marketing is on the rise, especially in the Los Angeles area (we are near Hollywood after all), but do you have a video department or even the proper equipment and cameras to make high quality video content for your company or organization? You might wonder why you even need video marketing but the more pressing question to ask is actually what is video marketing and how your company can benefit from powerful video marketing strategies? Simply put, video marketing is integrating videos into your marketing campaigns whether to promote your company, product or service. Video marketing needs to be taken seriously, in fact Youtube is now the 2nd largest search engine on the web and by 2020, 75% of mobile traffic will be video according to Cisco. If your company hasn’t been developing video marketing strategies, then it’s crucial that you start now. 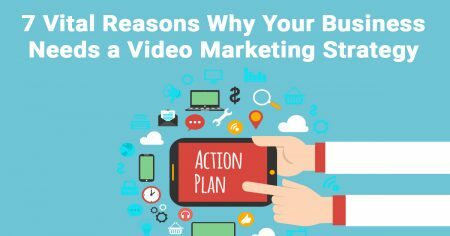 So here are just 7 reasons why your business needs a powerful video marketing strategy. Visual content is the key to greater engagement, especially when videos are so shareable on social media. Audiences are about 10 times more likely to engage, share and comment on video content compared to blogs or related social posts. In fact, videos on Facebook Business pages increase end user engagement by 33%. Take our Starbucks Unicorn Frapp video as an example! This was a fun video our team made together trying out current trends and got 1.4k views on Facebook. Sure a picture may be worth a thousand words, but even a short video can say millions for your brand. Videos are perfect for company branding and actually increases brand awareness by 52%. Check out this video we did, in partnership with a local Monrovia business, showing off our team personality while being relatable to our clients. This allows us to gain trust and emotion connection with our audience through one video. Why show off your products in a flat image when you can display it in a 3D realm, where customers can actually see how to use it? Videos are useful especially for your business to change how customers interact with the product. For example, why take a photo of a new lipstick product when you can highlight the colors and the product in use? This video is how our team boosted 2nd Love Cosmetics’ new lipstick product launch. The human brain prefers visuals, in fact 90% of information transmitted to the brain is visual and people retain 80% of what they see in comparison to only 20% of what they read! So don’t make it difficult for your customers. Instead make it visual, like this informative conservation video we made for the City of Monrovia. The large amount of text would be so exhausting to read, but as a video, the information is more easily retained and understood. You put in a lot of hard work into your business so your customers should know your achievements and capabilities! So videos are a perfect way to capture that, for example one of our clients was invited to be at the MTV Movie Awards Gifting Event and our team was at the event to film this accomplishment for our client. If the content is in a video, 65% of viewers watch more than ¾ of a video, which is more than most text-based content. Videos on retail sites keep visitors an average of 2 minutes longer so your company can capitalize in this by utilizing a video loop on your website, like this one we created for Magforce. Not only is it a visual way to display the products, it’s one of the first things customers see, drawing their attention to the product and keeping them on the site longer. The most important reason for using videos in your marketing plan? Video converts more customers; it’s that simple. Recent research shows that 71% of marketers say video conversion rates outperform other marketing content. Studies also show that 85% of customers are more likely to make a purchase after watching a product video. It’s imperative that your company needs video marketing if you want to boost your sales. So you might not have the equipment or team necessary, making video marketing sound very intimidating to a small business in Los Angeles, or any area for that matter. But Ready Artwork is here to assist you. Our expert team can help your company so you don’t need to break the bank hiring new people or buying new equipment. We are a full digital marketing agency in the greater Los Angeles area that would love to enhance your company’s marketing strategies so contact us today!